Nashville, TN -- Acclaimed guitarist Jimmy Capps will take a seat on Saturday, June 16, in the Country Music Hall of Fame® and Museum's popular series Nashville Cats: A Celebration of Music City Musicians. The 1:30 p.m. in-depth interview and performance, held in the museum's Ford Theater, is included with museum admission and free to museum members. The program will be streamed live at www.CountryMusicHallOfFame.org. A first-call session guitarist for over five decades, Jimmy Capps has earned his position on the list of Nashville's greatest guitar pickers. He has contributed to classic hits and contemporary favorites by John Denver, Alan Jackson, George Jones, the Louvin Brothers, Barbara Mandrell, Ronnie Milsap, the Oak Ridge Boys, George Strait and Tammy Wynette to name only a few. 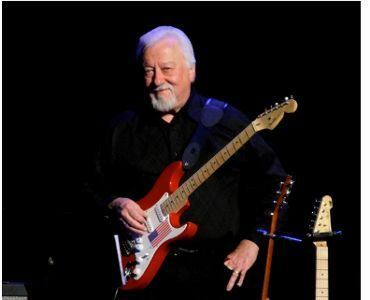 Born in Fayetteville, North Carolina, in 1939, Jimmy Capps was raised in Benson, North Carolina, where he grew up listening to the Grand Ole Opry with his family. His uncle was a champion fiddle player and encouraged him to play guitar. Capps also got support from local guitarist Hayden Ivey, who gave his own guitar to Capps so the boy could learn to play. By age 12, Capps was playing at local dances. Capps began making a name for himself performing on local radio stations. In 1956, he found work in radio and television in Florence, South Carolina, with Slim Mims. Later, he joined a band called the Tar Heels and played the local club circuit. In 1958, before he was 20 years old, Capps landed a gig that would change the course of his life and influence the sound of country music: He joined the Louvin Brothers' band. It was as the Louvins' guitarist that Capps first performed on the stage of the Grand Ole Opry. Capps' ability to move fluidly between acoustic and electric guitars made him an invaluable player in recording sessions, and his work has graced timeless classics such as "Elvira," "The Gambler," "He Stopped Loving Her Today," "Sleeping Single in a Double Bed," "Smoky Mountain Rain" and "Stand by Your Man." At the peak of his career, the "Master of Smoothness," as Capps was nicknamed, was averaging more than 500 sessions a year, often working with top producers Owen Bradley, Larry Butler and Billy Sherrill. After years of session work and learning from the best producers in town, Capps decided to try his own hand at producing. He subsequently helmed albums for David Houston, Jan Howard, Jim & Jesse and the Wilburn Brothers, among others. He also produced his own album, Jimmy Capps: His Guitar and Old Friends Making Memories. Capps can be seen every week on RFD-TV's Larry's Country Diner, where he plays the guitar-picking Sheriff Capps. He has been a member of the Grand Ole Opry staff band since 1967 and continues to perform regularly on the Opry.